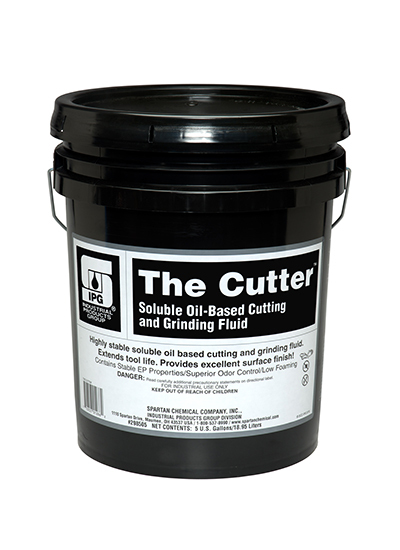 The Cutter is a multi-functional soluble oil-based fluid designed for most machining and/or grinding operations. The Cutter contains superior corrosion inhibitors to protect galvanized parts, steel, aluminum, brass, copper, their alloys, and the modern space-age alloys of today. The Cutter formulation contains an odor-killing component to control odors and eliminate slime build-up on machine surfaces and in coolant systems. Use of The Cutter reduces rancidity problems and greatly increases the life of the coolant virtually eliminating down time due to operator complaints and other associated problems with a spoiled, rancid coolant.The Cutter leaves a non-sticky, free-flowing water re-emulsifiable corrosion protective film on both machine and parts. No sticky, gummy, tacky build-up to tie up machines or aid in bacterial growth.